Exoprise recently introduced a new CloudReady setup and deployment method for CloudReady Private Sites that makes it even easier to share CloudReady among teams. Just to remind readers, a CloudReady Private Site (aka Secure Service) is our agent that runs on any Windows OS for running CloudReady sensors. 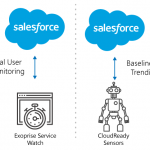 Ideally, a CloudReady Private Site runs sensors in the same locations and conditions your users are experiencing for end-to-end network monitoring, testing and network assessment. On a small Windows® Virtual Machine (VM) you can easily run 10-15 sensors. We have a Windows® XP VM with 1GB of RAM that runs 15 sensors and has for > 3 years. 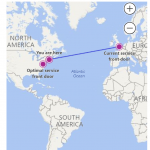 Private Sites enable our customers to build their own sensor network wherever they have users and want to monitor Websites, applications and other services. Exoprise also hosts its own Sites, Public Sites where you can deploy sensors. Deploying sensors is the exact same for both public and private sites. “Get-A-Site” is the new deployment method. We’ll briefly cover the 1 and 2 for comparison. Guided Deployments assist with key and client-side certificate management, agent installation and validation that everything will be setup correctly. These steps could all be done manually with command line routines but we make it nice and wizard driven. Generate a join key attached to the public/private key-pair. This is like two-factor authentication for the public/private key-pair and also gives additional control around the re-use of the keys. More information is available here. The bulk deployment option is perfect for system administrators who want more control and are deploying lots of Private Sites. Bulk deployed Private Sites can also easily be re-imaged and will reattach to the sensors that have been assigned to the site. Our new methodology is called “Get-A-Site” and its quite handy. With the “Get-A-Site” deployments, a CloudReady Administrator (Deployer Role) can generate a new installer with all the settings baked in. An administrator can even configure what the installer will look like – i.e. the different prompts and wizard pages that will show up during installation. This is important if you are giving the installation to a user who is not as technical — you can avoid unnecessary prompts. Sometimes a branch office has a separate or occasional IT administrator, possibly in a different timezone. Without full access you can have them install a site and it will be ready for deploying sensors to it in remote locations. 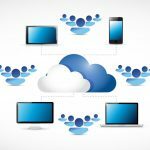 Often data center admins are a separate group from the admins of Office 365 or other SaaS Applications. With this new deployment method you can give the data center team the CloudReady installation and they can set it up for you. CloudReady sites can run alongside anything, the resource requirements are low. With the ‘Get-A-Site’ method you can give an installation to someone who owns a resource, for example a backup Domain Controller, and they can deploy the site. Internally developed apps can be easily tested and monitored with CloudReady. With CloudReady integrated Role-Based Administration and Control (RBAC), different installations can be tied to JOIN keys for easier deployment and internal group use. Lastly, we have customers that deploy sites to executives that are on the road or working from home. Have a user that is always struggling with performance? Give him a CloudReady site installation for deploying monitoring to his own machine. You can even configure the installation UI so that its a single prompt when he installs. Once someone executes the ‘Get-A-Site’ installation, the agent attaches to CloudReady with the right organization, keys and settings and is ready for deploying sensors to it. 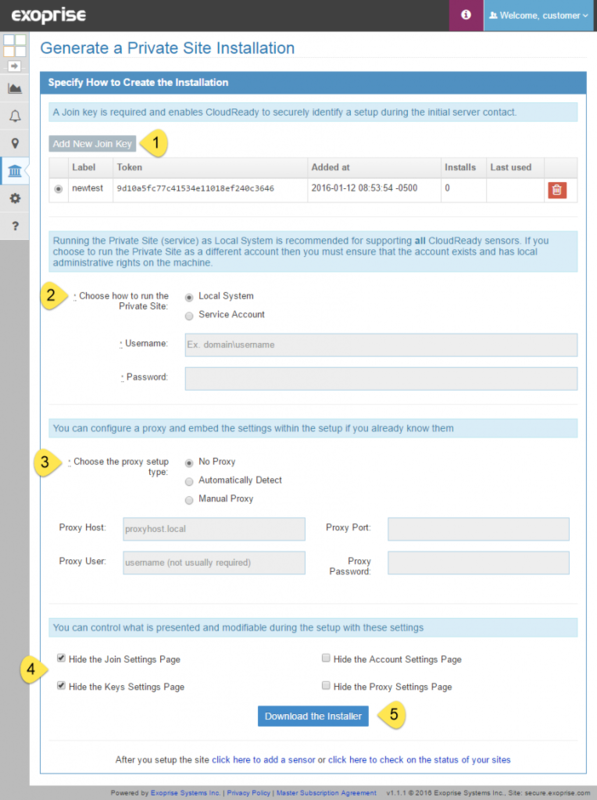 This securely identifies a CloudReady Installer to your account. It also provides a way for you to control the distribution of the installer. 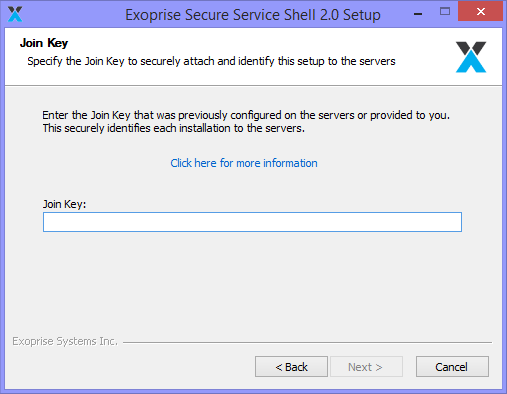 If you remove the JOINKEY, then the downloaded installations become invalid. The service can run as local system (recommended) or a service account for more integration and control within your domain. If you supply an account name then the account MUST exist before you run the setup otherwise it will fail. Many of our customers have proxied Office 365 environments and often want to emulate the end-user experience behind a proxy. CloudReady has, from the beginning, supported proxied environments and they can be configured for the Private Site setup here. If you would like the end-user who will be installing the Private Site to have more control over the installation then you can configure what wizard pages the user will be able to see. This enables a setup to be created that can be customized further in each environment. That’s it. Download the setup and you are ready to install a new Private Site. There you have it. The new Exoprise deployment method utilizes some very clever technology and security methods to make setting up and deploying new CloudReady sites as easy and flexible as possible. Now our customers have more options to control and deploy CloudReady wherever they need monitoring and it’s simple, accessible and controllable.